Aside from fresh from the garden vegetables and iced tea, nothing says summer gathering to a Southerner like congealed salad. However, outside of the Southern United States, most folks refer to them as Gelatin or Jell-O salads. We just like to be different. The possibilities of a congealed salad are endless, much to the delight of it’s devotees. My great grandmother, who lived the majority of her life as a sharecropper, considered congealed salads to be the ultimate treat. Back in her day, though, it was a treat which could only be enjoyed in the winter due to them not having a refrigerator. Alabama summers would never allow the gelatin to set up in this heat! My grandmother says that in the winter time Lela had an old wash tub she kept out back of her house. She’d let it fill up with water and as soon as it got cold enough to freeze, off she’d go to mix up a congealed salad in her kitchen and then set it out on top of that ice to set up in time for dinner. When Lela was older, she lived with my Grandmama and Granddaddy. Each week they’d make their pilgrimage to the grocery store, the one time Lela went out. She’d get dressed up in her good dress and hard leather shoes, hook her black handbag in the crook of her arm, and come back with twinkling eyes and a brand new container of pre-made congealed salad. In her mind, she had really moved up in the world to be able to afford such a thing! 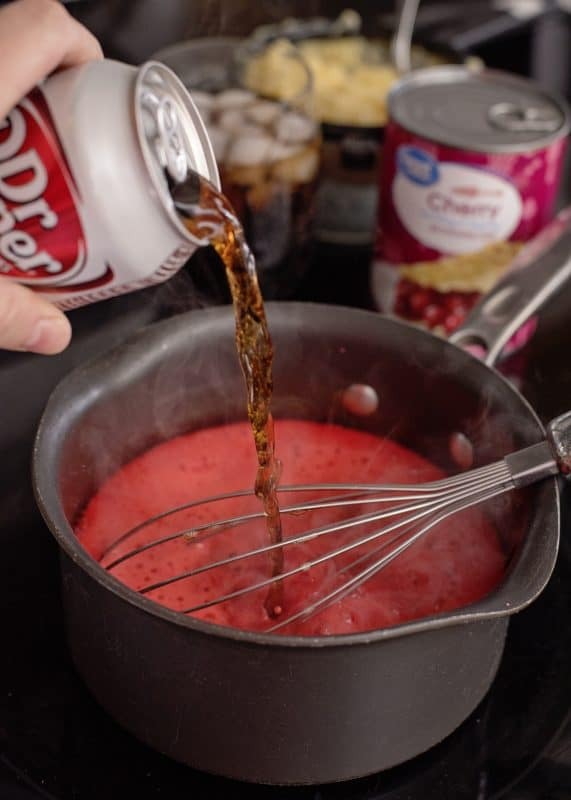 That’s right folks, today we’re gonna make a congealed salad with Diet Dr Pepper! Don’t worry, if you don’t share my DDP addiction, feel free to use your favorite coke, the original recipe called for cherry. 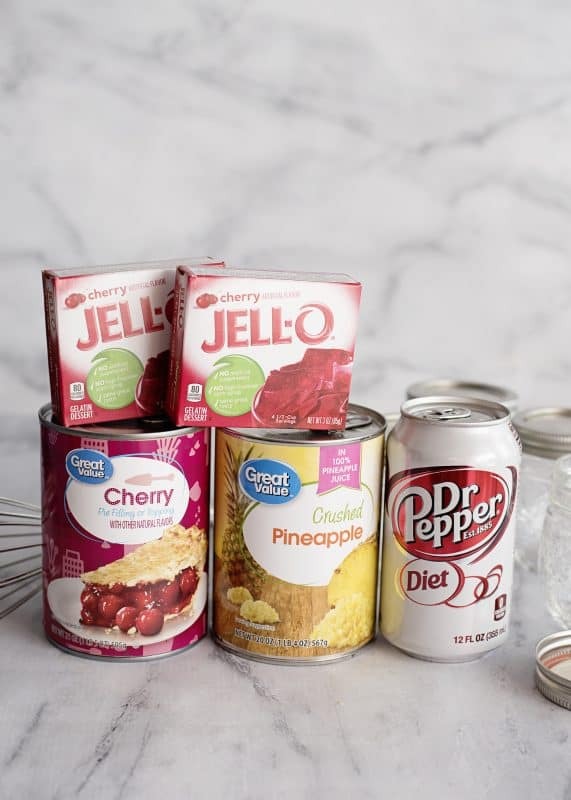 For our ingredients we’ll need: crushed pineapple, 2 packages of cherry gelatin, 1 can of pie filling, and a diet dr pepper (or coke of your choice). The actual recipe is at the bottom of this post. You can use sugar free gelatin if you like as well as low sugar cherry pie filling! It will turn out just as delicious! *Note: I use kosher gelatin that is found at most grocery stores now, but Jello brand (pictured) is not. Drain your pineapple, reserving the juice. In a saucepan, bring 1/2 C water and pineapple juice to a boil. Once boiling, add gelatin. Stir until dissolved. Stir in Diet Dr Pepper (or coke of choice). Now the great thing about this recipe is that you aren’t quite gonna use that whole can. There is a nice little swig left for ya in there! When you do that, it’s gonna foam up some. Just lettin’ ya know so you don’t worry. Add in pie filling and stir that up. Until it looks like this. Add in pineapple. 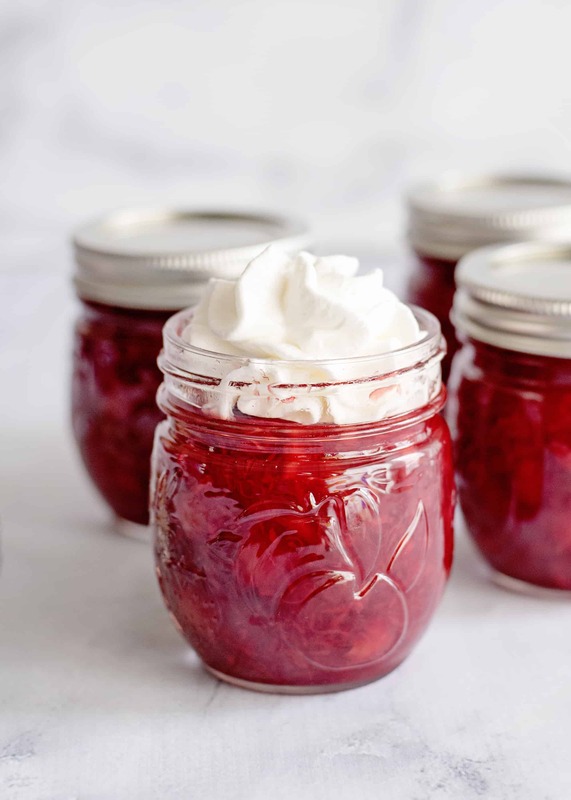 Use individual 8 ounce mason jars to spoon it out into. See how pretty? Now put the lid on these and store them in the fridge. Make sure they are good and cold before serving so they will be set properly. Individual little desserts are such a fun way to serve this! Top with some whipped topping to finish it all off. Enjoy this deliciously different salad! Drain pineapple, reserving the juice. Set aside. In a saucepan, bring pineapple juice and water to a boil. Add gelatin and stir until dissolved. Stir in diet dr pepper. 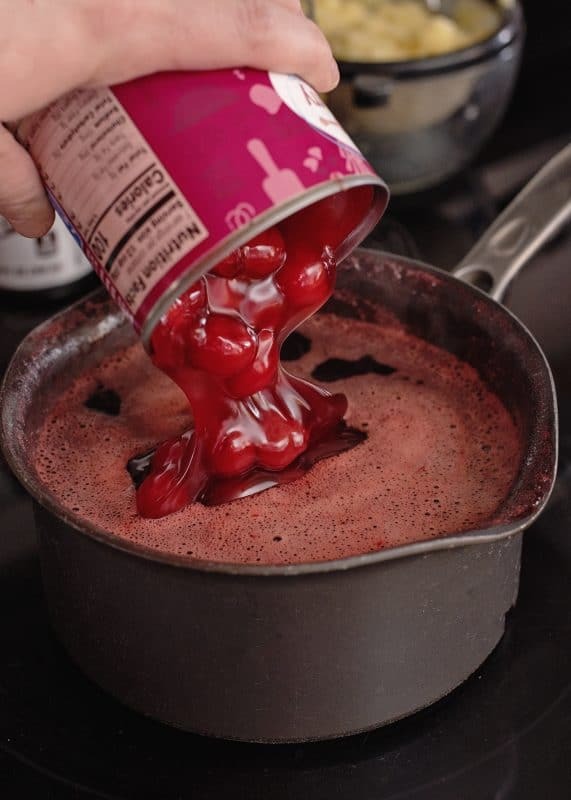 Stir in Cherry pie filling. Stir in pineapple. Pour into mold or serving bowl. Refrigerate until firm. Serve cold. If you’re visiting for the first time today, you might want to check out some of my favorite posts below! There are around 2000 more so be sure you scroll through the index page! 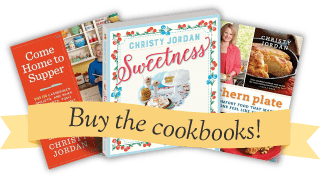 Southern Plate is filled with classic Southern recipes, quick and easy family favorites, and stories galore! I am so grateful you stopped by and do hope you’ll have time to say hello in the comments section below. Thank you all for letting me be a part of your lives and for all that you give me each and every day. ~Dale Carnegie Submitted by Southern Plate reader, Ticha. To submit your positive or motivational quote click here! You know I don’t think I’ve ever had a congealed salad. Is my southerer card going to taken from me? As long as I don’t get banned from here I’ll be ok.
Hi Christy, I’m from Southern California! Does that count, lol? I’m a southerner at heart and I made that vinegar salad and OMG, I ate half of it while I was making it! Sooo good. I used only 1/3 cup of sugar, and I used 1/2 cider vinegar, and it is out of this world. Also, I used my mandolin rather than rough cut. Just a little difference in texture. If you like a little heat, like I do, your favorite chili powder or sauce is great. Just enough left for two chicken sandwichs! . A Dr.Pepper salad. Now that sounds very innovative. I will have to try it. Thank Tina for me. Congrats with the mention on the magazine! Thats awesome! You’re moving on up Christy. Same here in Texas. What kind of coke do you want? Dr Pepper. So, how do you eat this? Just as a little snack or dessert? 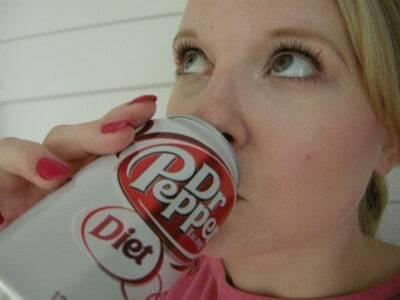 Is the Dr Pepper for the flavour? No diet here either, Su. Diet Coke=dishwater. I don’t like the taste of Diet Coke. There is Coke Zero, I’m guessing you have it over there too, which is basically Diet Coke but uses a different type of artificial sweetener to give it a more true Coke flavour, but even that falls short. Same here. I’ll seek my diet stuff elsewhere. LOL, no where near the same thing! Here is where Southerners are brilliant, Su. This salad, kind of like our sweet potato casserole, can be served as a side dish! Even though we all know it is technically sweet and therefore a dessert, you can serve it as a side dish and then STILL get dessert on top of it! See? Brilliant, I tell ya, brilliant! Christy, have you ever made this salad using Sugar Free jello,, diet soda and light pie filling? Wonder if it will come out okay and what it would taste like? You’d have the sweetness of the crushed pineapple to offset the SF and Diet and Light ingredients. I just made my cranberry/crushed pineapple congealed salad over the weekend..We just finished it last evening.. It calls for 2(3 oz. each) red flavored jello..I used SF raspberry flavor, 20 oz. can crushed pineapple in it’s own juice, 1 cup. chopped walnuts, 1 (16 oz. 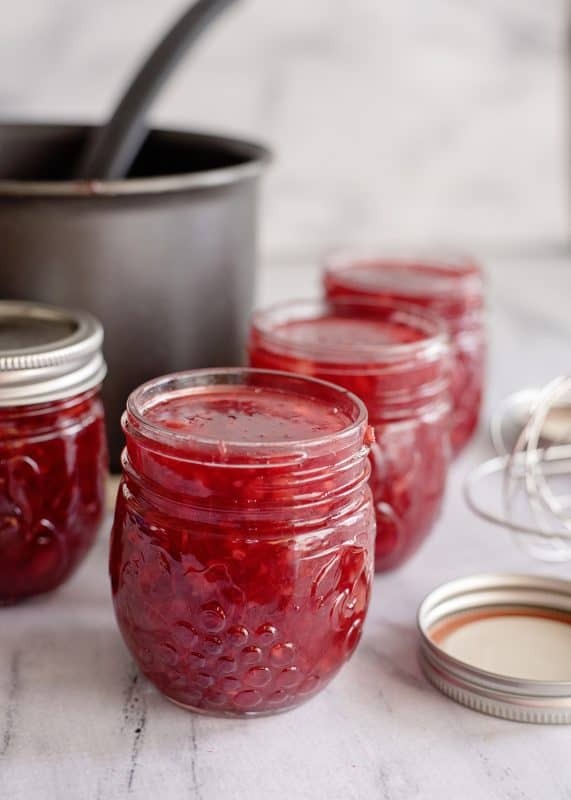 )can whole berry cranberry sauce. Some people add chopped celery but I have never used celery in my version. My recipes makes a large amount..It filled a copper pineapple mild and an 8 x 8 in. brownie glass pyrex dish, that I cut into squares when I served it. Of course, the molded pineapple, we just used a spoon and dug what we wanted out, topped it off with Cool Whip. since there was just the two of us “senior citizens.” If I had company, I’d unmold the copper mold properly and serve up on a bed of fresh lettuce leaves on a platter. I’d like to try your recipe sometime..The Dr. Pepper should add a nice “kick” to the jellow mold! Bet that pie filling really adds a nice touch to this recipe. 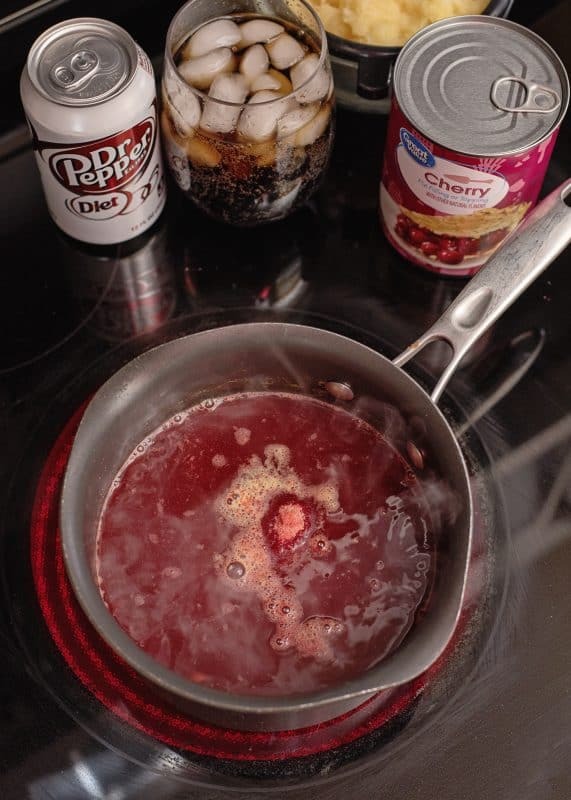 Christy, we need the Dr. Pepper jingle song after this recipe! LOL! Hey, Southern Gal, did you ever add peanuts to your coca cola in the bottle? My husband has a fit when he sees me do this. I love boiled peanuts and when I go “down home” if I come across some anywhere, I buy them. Tried to make them once myself but they never turned out. We used to have a classmate that his Mother would make large batches of them in the early Fall months and put them in small brown bags and her son would bring them to school and sell them, or young kids would walk along the beach during the summer time selling bags of them. Yummy! Only a Southerner knows what I’m talking about! A jello salad with Dr. Pepper – that’s a first for me!! Might just have to try it soon. Thank you, Jody! Hope you like it as much as I did! 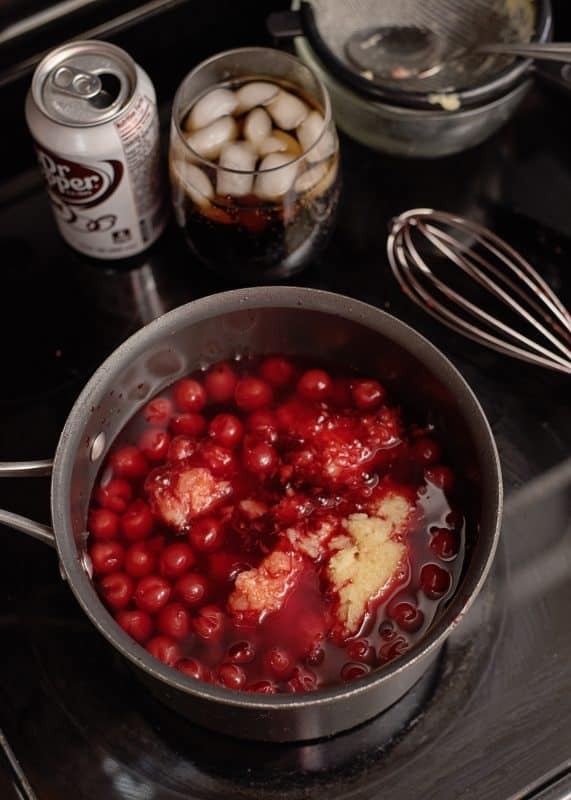 That looks great, all sorts of possibilities, with all the fruit sodas out there, and all the pie fillings. Heck, you could even use prunes and prune juice if you’re visiting folks in the nursing homes. Way to go. I love your suggestion!! It helps if you say it with ENTHUSIASM! When I was a kid I loved prunes. Prune juice, no. But the prunes? Loved them. Wow, that looks yummy I have never had a Congealed Salad before besides a box of jello with a can of fruit cocktail thrown in lol. I will definitely have to try this bet the kids will love it! Thanks again Christy for another delightful recipe! So I guess I have eaten congealed salad before. To me that is just jello with fruit in it. Guess the Californian in me is showin’. I’m going to try this one. Sounds like a great treat on a hot summer day, and as soon as we get one I’ll make this. We’re having summer a couple of hours at a time, very strange weather here in the northeast. I can’t have caffeine so no Dr. Pepper for me, but I love cherry soda ~no caffeine~ and think it might work just fine. Thank you for another fun recipe, Christy. Have you ever been to Perth in the summertime? Now that is heat. Not that we are competing. Just sayin. Lol 🙂 our heat is so dry and the air burns. We hate it but we love it too. You could use cherry 7up too. The coke (aka soft drink, pop, soda, etc…) is just to add to the flavor. When I serve a congealed salad, my daddy gets excited because he knows he can eat the salad and still have dessert! I think I can come up with a few to share! Sounds delicious. But do you add the pineapple? You only mentioned the juice. Yes Ma’am, you sure do! That’s what I get for posting after ten p.m.! Now I’m up at two a.m. correcting it because it was bothering me. I fixed it, stirred it in right after the cherry pie filling! Thanks for pointing that out, y’all are sharp! Wow, can’t believe we like the same drink, besides our tea. I have been drinking DDP for so many years, that I can’t remember. I have seen the cans change colors and designs so many times. Now this salad does sound really good. Will have to make it. We all need something really cool now adays, when temperture in touching 100. Thanks again, for another great sounding recipe. Hey Trixie!!! YES YES YES!! Remember the blue can? I have an old metal sign for “Sugar free Dr Pepper” back before they even called it diet. When I was little my grandparents kept sugar free dr pepper at their house and we got to have one when we went to visit. I always thought my grandparents were rich because they had cokes to drink and all of the cantaloupe we could eat! Thank you so much for taking the time to comment and read my ramblings! Went back and checked the recipe really well. Line for line, and it’s true you didn’t mention when to put the pineapple in. Please Christy, answer before tomorrow. I really want to make this one. I’ve seen this stuff numerous times In the grocery store and never knew what It was exactly. I would of tried It, but wasn’t about to pay a ridiculous price for It! Now that I know what It Is exactly, I’m going to be giving this a try. Although I’m not a DDP fan, more of a Coke kinda guy. If I could, I’d be a coke kinda gal. Totally with ya, Shane! I can’t drink sugar though and as far as diet drinks go, DDP is the best I’ve found. Drink a coke for me today (please), and let me know if you get to try this! Try Cherry Coke Zero sometime, Christy. It’s pretty good! Unfortunately, it’s hard to find smaller sizes, but most grocery stores carry the 2-ltr. This sounds interesting – never tried making a Jello salad with any kind of soda before. 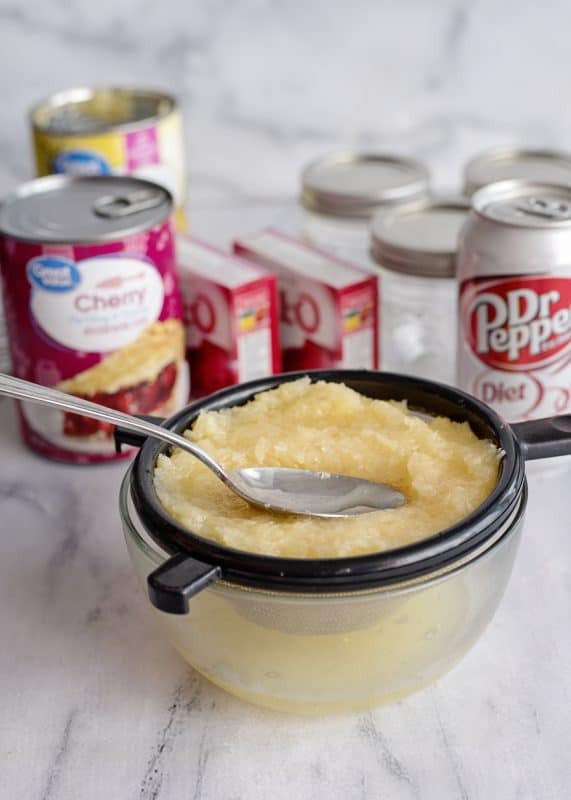 Since my Diet Coke passion equals your Diet Dr. Pepper addiction I look forward to trying this receipe with my favorite cola. Congealed salads just beg to be served at Sunday Sountern Suppers. I’ll be recreating yours this weekend and thinking of you with every yummy bite! As always, thank you for sharing receipes from your home and heart! As I make them for my family we’re creating great memories of our own with each tasty one! I can’t wait to try this one Christy. I love Dr. Pepper too, but the Cherry Coke also sounds good. I may try them both!! You’re right though, everything here is GA is “Coke”, lol !! hEY – LOOKS REALLY GOOD. HOW ABOUT ADDING A HANDFUL OF CHOPPED PECANS? I LIKE A LITTLE CRUNCH NOW AND THEN IN MY SALADS. SPEAKING OF SALADS – I MADE THE FIRE & ICE – SO-O-O GOOD! I MADE IT AGAIN AND TOOK IT TO OUR TRACTOR PULL COMMITTEE COOKOUT LAST WEEK AND IT WAS A BIG HIT THERE. I’M SURE YOU DON’T MIND THAT I HAD TO GIVE OUT YOUR RECIPE SEVERAL TIMES. IT’S A GREAT SUMMER DISH, IT JUST SEEMS SO COOL WHEN YOU EAT IT. MY HUSBAND WOULD EAT IT EXCEPT FOR THE CUCUMBERS AND MY SON WOULD EAT ONLY CUCUMBERS, I ATE ALL PARTS, SO WE BALANCED OUT REAL GOOD!! I have always loved these kinds of desserts and this one looks fantastic too! I’m like Sabrina, I think this is just fittin’ for some pecans! Hi – This sounds good…..no matter what kind of “coke” you use. I think I’ll fold in some Cool Whip to lighten it up some. My family likes all kind of Jello salads. They’re aso versatile with so many flavor combinations. I just love this website. You’re my kind of cook. Well duh………why hadn’t I thought of using a cold drink in mine. I’m slippin’ in my old age!! I was born in and brought up in So. Cal with an Okie step-father, and lived in OK for over 20 years, I just say “soda” anymore, because I just am too confused to know the difference. I honestly can’t tell the difference from supper and dinner. My husband corrects me everytime when I ask him “what do you want for dinner” and it is after 5pm… It is all too confusing, my mother was from Iowa, so she had her own sayings too…what’s a gal to do? Hey – haven’t talked to you in awhile – even though I will miss seeing you at Brookhill in a few weeks. I can’t believe the summer is almost over!!! This salad looks so delicious. I love everything except the cherry pie filling. 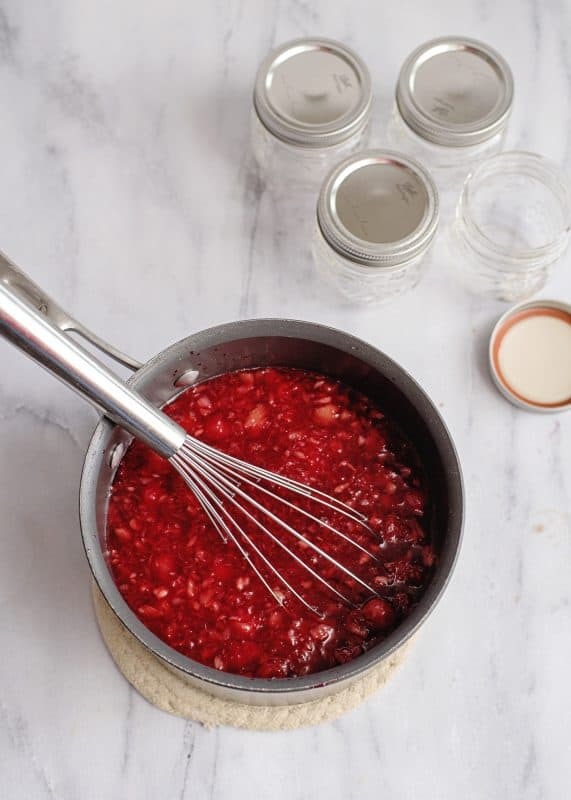 Do they make a strawberry pie filling? If so, could you use that? FYI: Dollar General (the new one on Hwy 251!) has 6 packs of Dr. Pepper/Diet Dr. Pepper on sale for $1.00! I have got to go get some. I think it is for the rest of this week. I don’t know if all of the other Dollar Generals will have them at that price. ??? I’m a Diet DP fan/addict too! There’s a lot of us out there. Remember Diet DP Vanilla? I wish they would bring it back! Guess What? I’m going to make this salad and top it with a tad of that marshmallo, cream cheese mixture….and maybe a cherry on top! 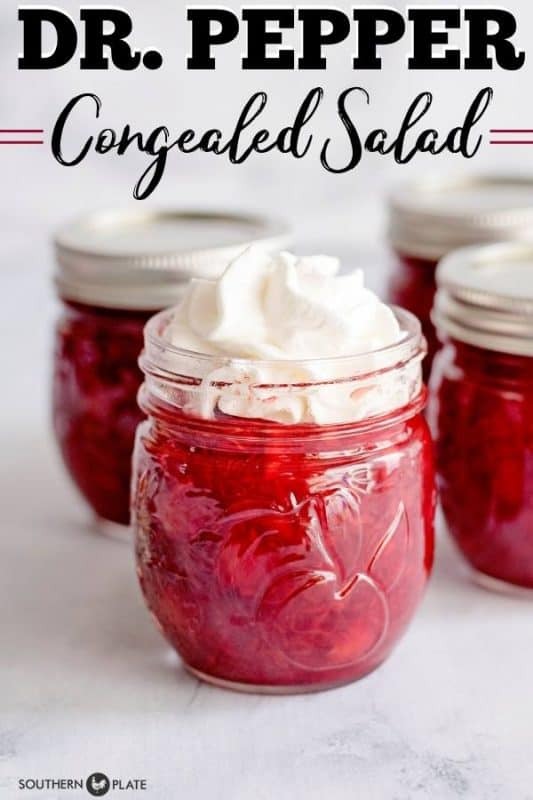 I want to make a congealed salad with whole cranberry sauce. As I’m typing this I think I should combine the cranberry sauce with canned mandarin oranges, diced apples, pears, and orange soda. Thanks, for the inspiration.